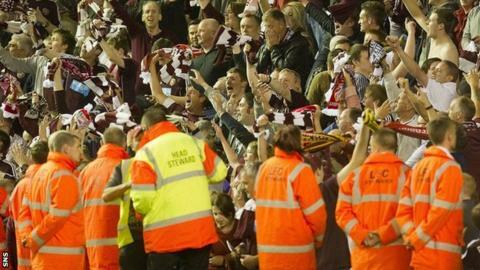 Hearts have been fined £4,000 for "field invasions" by fans at last month's Europa League match with Liverpool at Anfield. Supporters of the Edinburgh club spilled out of the stand when they took the lead through David Templeton. The winger's late goal levelled the tie on aggregate before Luis Suarez equalised to put Liverpool into the group stages. Hearts had lost the first leg of the tie 1-0 after an Andy Webster own goal.